New rules in cricket: Players can be sent off! London - Ben Stokes was included in England's 16-man squad for the Ashes tour of Australia announced on Wednesday despite breaking his hand in the incident that led to his recent arrest on suspicion of causing actual bodily harm. Durham all-rounder Stokes was dropped for Wednesday's fourth one-day international against West Indies at The Oval - the venue for the Ashes squad announcement - after being arrested early on Monday in Bristol. That followed England's win in the third ODI in the southwest city on Sunday. Stokes, 26, remains under investigation after being released without charge. For the time being, he has retained his position of vice-captain to Test skipper Joe Root but England and Wales Cricket Board (ECB) cricket director Andrew Strauss told an Oval news conference. "Ben did have an X-ray yesterday (Tuesday)," said Strauss. "Early results are that he has got a minor fracture on his right hand," the former England captain added. "There are obviously more tests that need to be done, but the early indications are that he should be fit to play a full part in all the Ashes Test matches." 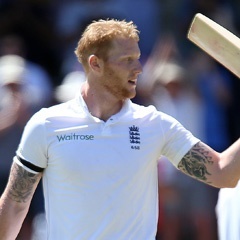 The injury to Stokes' right hand is believed to have been sustained during a confrontation that left a man in hospital. A police investigation is unlikely to be concluded before England leave for Australia on October 28, meaning the incident could hang over Stokes for the whole tour. Moreover, Stokes is just one on-field offence away from incurring a potential two-Test ban under the International Cricket Council's code of conduct. England ODI regular Alex Hales - an Ashes long-shot who did not make the Test squad - was also left out of Wednesday's match after being with Stokes on Sunday night. The pair could be among several England players who face ECB action, with Strauss saying: "What I am doing is speaking to the players individually to get their accounts of what went on. "They may be subject to disciplinary proceedings including Ben," explained Strauss, the last England captain to win the Ashes in Australia in 2010/11. England's squad contained three uncapped players in 23-year-old Somerset fast bowler Craig Overton, 20-year-old Hampshire leg-spinner Mason Crane, who will provide support to Moeen Ali, and Surrey wicket-keeper Ben Foakes, 24, included as cover for Jonny Bairstow. Meanwhile there were recalls for middle-order batsmen James Vince and Gary Ballance despite the pair's struggles during their previous Test stints. Vince was dropped at the end of the 2016 English season northern summer following a poor run of seven Tests that saw him post a top score of 42 in 11 innings against Sri Lanka and Pakistan. This season Vince is averaging a modest 34.82 in first-class cricket for Hampshire but England believe his game will be suited to Australian pitches. Ballance only managed 85 runs in two Tests against South Africa at an average of 21.25 before he suffered a fractured finger. Overton got his chance ahead of the likes of Mark Wood and Steven Finn after taking 43 Championship wickets this season. Essex batsman Tom Westley, who failed to convince at number three this season, was dropped. This has been Root's first season as Test captain, with the Yorkshire batsman overseeing home series wins against South Africa (3-1) and West Indies (2-1). But England national selector James Whitaker said: "A tour of Australia is the ultimate test for our squad." In addition to England coach Trevor Bayliss's regular staff, there will be some new faces in the Australian's backroom set-up, with former New Zealand paceman Shane Bond appointed as a fast-bowling consultant. Bond will fill the gap left by former bowling chief Ottis Gibson's departure to become the new head coach of South Africa up until the end of the second Test. Former England one-day captain Paul Collingwood, Stokes's captain at Durham, will also take a coaching role during the Test series. England hold the Ashes after a 3-2 win on home soil in 2015. But their last tour of Australia saw them suffer a 5-0 Ashes defeat in 2013/14. The first match in the upcoming five-Test Ashes series is set to start in Brisbane on November 23.